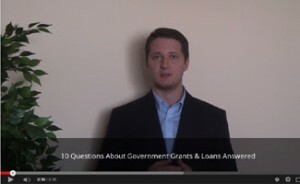 Regularly we get LOTS of questions about Canadian business grants & loans from our clients. That’s why we decided to record a short video where we tried to answer 10 Most Common Questions! Watch the 8-minute video on YouTube now and get answered too! If you don’t find the answer to your question(s) in this video, simply write them in the comments to the video or email them to igor@fgwinc.ca. And we’ll respond them as soon as possible. P.S. ANY questions from you, your partners, clients, suppliers and other businesses in your community regarding Government funding are welcome!